Underwater coral gardens and marine lives are one of the main tourist attractions in the Maldives. Most of the tourists are none divers, they discover beauty of the underwater world by snorkeling. What they don’t know is not every fish in the sea are free from harm. In fact some are deadly. 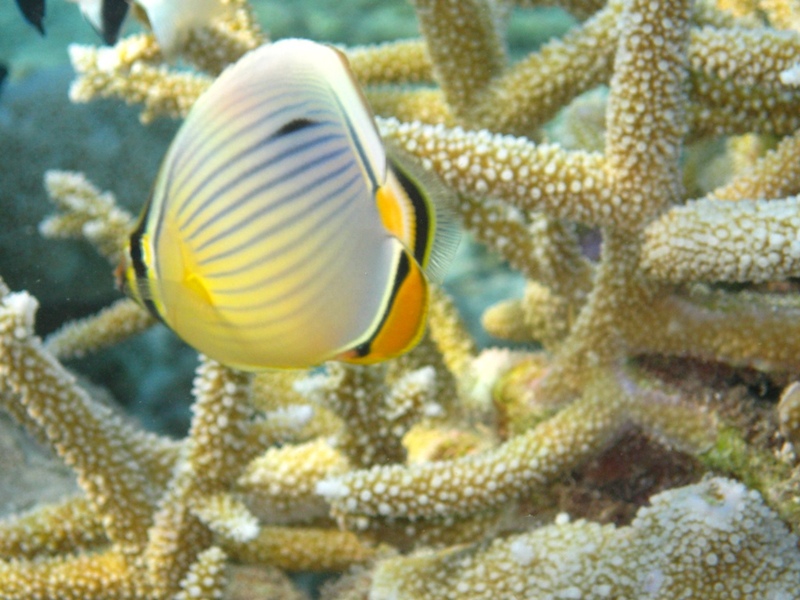 You should know which fish are aggressive and how to stay safe while snorkeling. Even the aggressive fish are beautiful and with proper caution you can explore their beauty without putting yourself at risk. Unlike snorkelers, divers are generally well aware of marine lives as they go through tests during certification. Species of fish found in different parts of the world always vary, conditions at different destinations vary too. A fish that is friendly in Maldives could be otherwise in Thailand or Egypt. Aggressive species of fish listed below are for the environment of Maldives. This is one of the most beautiful fish you can see in the Maldives. 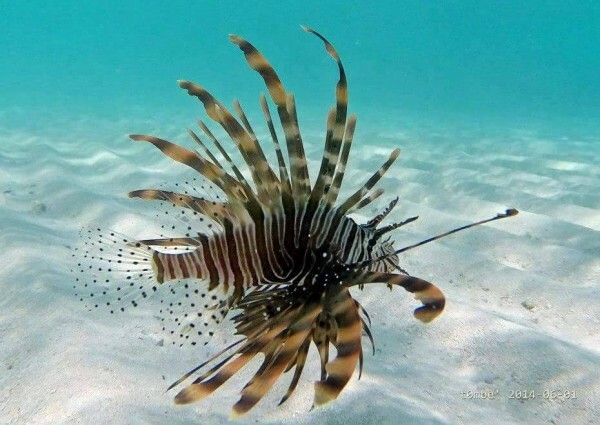 Lionfish are very rare to spot, but they are deadly if got bitten by its poisonous sting and medical care is not obtained fast. They live in the lagoon and reef as well. The fish that is about 3 – 4 inches in size, likes to protect its territory. If you come too close it would fly to you and inject its venom in your body. If you pose a threat it would protect itself. The golden rule of thumb is to keep at least 8 feet distance from the fish and be calm. They don’t proactively chase and attack people (they are not human beings). 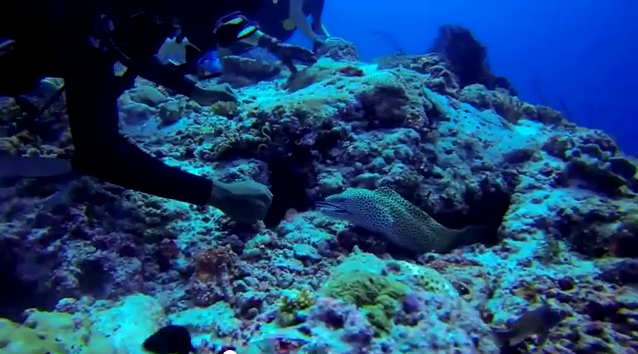 This sea creature is very common in the Maldives and there are different types of moray eels. Their teeth are razor sharp and they would only attack if you pose a threat to them or thinking you are food. Their vision is so bad that you can consider them colour blind. They live inside corals and often keep their heads out looking for something to eat. At tourist resorts they are usually friendly, tourists would go as close 4 feet. But, don’t take unwanted risks. Keep 8 feet distance and you are safe and sound. 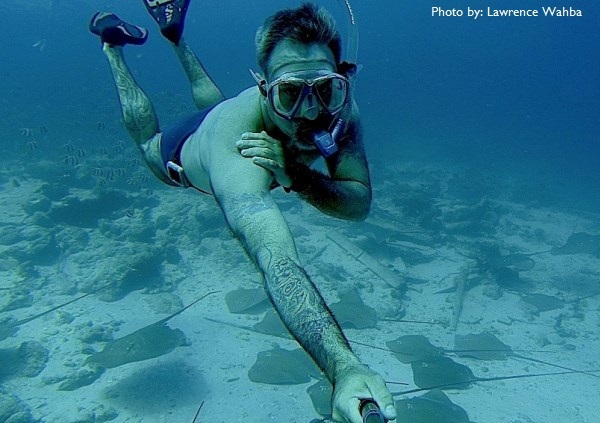 Stingrays are also very common in the Maldives, especially at the resorts. They have a deadly weapon on the tail. But they would sting only on self-defense and when they do they would often go for critical parts of the body such as chest or neck. It is an amazing creature to snorkel with, just keep 8 feet distance and enjoy. You can actually go even closer but to do that you need to understand it, you should know if it is feeling safe from you. Stingrays are commonly found in the lagoon. They dig the ground and stay on shallow holes with sand on its back so that is looks camouflaged. But, you can still see its tail. If you mistakenly step on it that is dangerous. If you are walking in lagoon always look for the tail. If there is a tail there is a stingray and they can never hide tail. Unlike moray eels stingrays have a very good vision. If you see them they would see you. Black tip reef shark and white tip reef shark are commonly found in lagoon and at the reef. 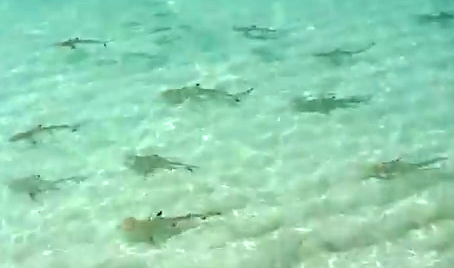 Hammerheads and nurse shark are also found in the waters of Maldives. None of these are actually aggressive if you do not touch them. But, one thing to keep in mind is that sharks have a very bad vision and their sense of smell is extremely strong. Do not carry fish bait or blood while snorkeling; sharks could mistakenly go for you. Some of the resorts feed fish once a day, usually in the evening. Do not swim or snorkel during this time. It is dangerous. The bad vision of sharks could easily spot you as their dinner. Don’t ever step on a Sea Urchin. Their pikes are razor sharp, even a gentle touch on a spike would pierce your skin and goes deep before splitting off. The spike is a very weak substance, it is very difficult to take out as it splits into pieces. It is a painful experience. 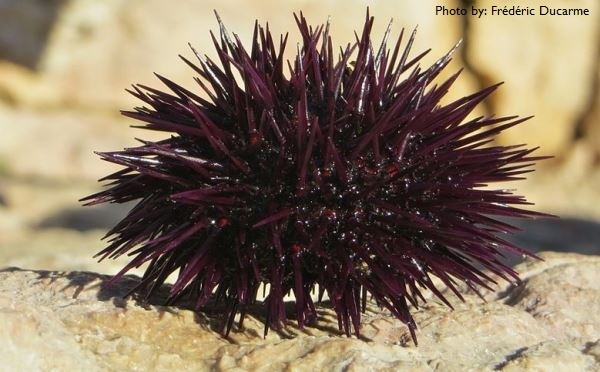 Sea urchin is living creature that moves very slowly, you don’t actually see it moving but you would notice it does not necessarily stay same spot every day. Sea urchins come in a variety with attractive colours and look beautiful. Enjoy the look and take pictures, never touch in any case. Many types of corals of difference colours are found in the reefs. The edges are often sharp. Do not touch corals as it might cut your skin. Touching corals also harm them from growth which is very slow process. To protect coral reefs and to stay safe do not touch corals and any other marine lives, see the beauty and take pictures. In an unlikely case you ended up injured by coral, do not be careless to ignore. Any cut could easily get infected. Apply a disinfectant as soon as possible. Vinegar is a great natural disinfectant. Dive boats always carry a bottle vinegar to treat unlikely accidents. 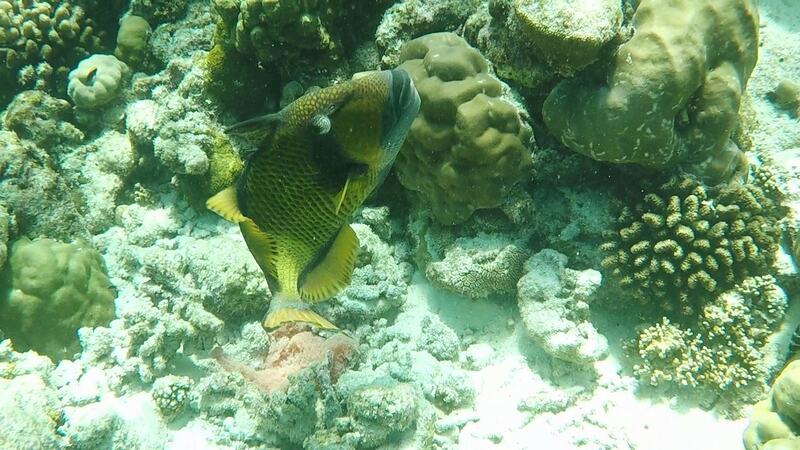 Triggerfish is usually not aggressive to snorkelers and divers. But this Titan Trigger fish on picture has eggs laid to its nest as you see like pale orange foam. During breeding period the triggerfish guards the nest and anything that comes too close will be warded off, divers and snorkelers are no exception. This picture was shot on 11 December 2017 off Veligandu Island Resort. 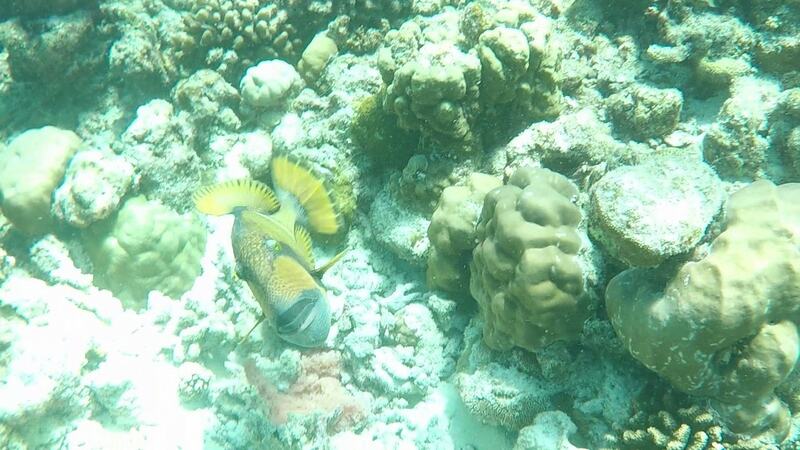 I saw the triggerfish facing down towards her eggs and I knew it would attack me if I got too close. But, I wanted to take some pictures to update this post and my camera was the only object I had to use to defend myself. I swam above it on the surface and triggerfish did not bother, depth was about 3 metres. I dived in and swam close to about 2 metres and that was when it turned to me with an aggressive look. She made a few turns to both sides and suddenly flew towards me. I almost smacked it with my camera for protection and only then it turned back. If I did not react quickly it would have bitten me and its teeth were bigger than mine. If I had nothing for protection I would have used my fist to give a blow. Hitting the mouth would probably hurt me but I can't think of a better way to escape. Of cause, if you see the nest in a distance and triggerfish is not coming to bite you then you can always avoid a confrontation. 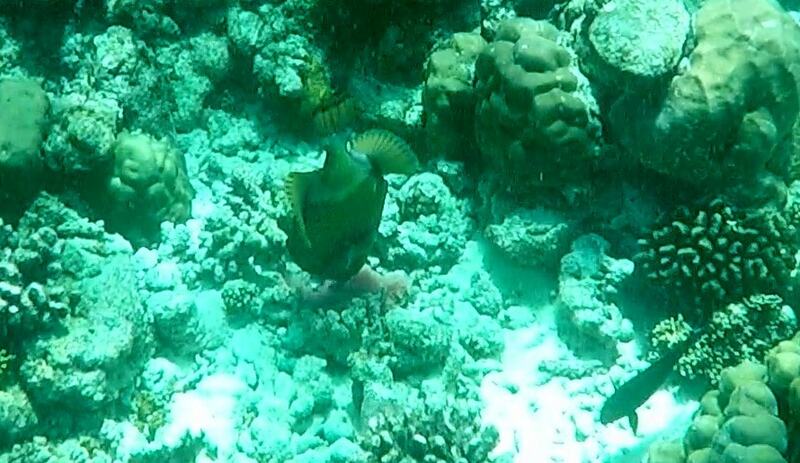 In my case I had some previous experience with triggerfish and I was confident to get a little closer. I suggest to keep at least 3 metres from any trigger fish on its nest. If you see a triggerfish facing down like this you should be cautious. Most of the time you may not see eggs or not notice its nest. But, this posture is the most obvious clue for you. In normal circumstances triggerfish swims around and would not even stay still for you to get close, it would swim away. For your safety follow the golden rule of keeping 8 feet from any fish in the sea. Do not touch coral or any marine lives. See the beauty and capture it with your camera, not with your fingers. Do not swim or snorkel alone, always accompany with a partner as current and waves could change in an instant. Do not take unwanted risks, wear life jacket if you are not a strong swimmer.